At Seyana Jewelry we take pride in our handmade pieces and strive to create each one with expertise and care. Please remove your jewelry before showering, swimming or bathing in hot tubs. Avoid exposing jewelry to shampoo or other products like hairspray, hair dyes, perfumes or lotions. Apply your beauty products first, then adorn yourself. Metals, gemstones & pearls can be polished with a soft cloth. Avoid strong chemical solutions and ultrasonic cleaning. Always remove your jewelry before using any product that contains bleach. Bleach can cause gold and other metal alloys to break down leaving the metal irreparably damaged. Store your jewelry in a safe place like a pouch, box or lined jewelry case. Exposing druzy to minerals in tap water or the ocean can cause the gemstone to dull and lose its sparkle and color. Please remember to remove your jewelry before showering, swimming or bathing in hot tubs. Druzy quartz can be cleaned using warm soapy distilled or purified water and a soft brush. Or, soak it in the mixture for 10 minutes. Rinse with warm or cool distilled or purified water. You can dry it with a moving hairdryer set to cool or warm and pat dry the sides and back with a soft cloth. If you pat dry the druzy side use a lint-free cloth that will not leave fibers on the druzy surface. 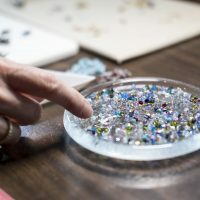 As with most gemstones, it should be kept away from household chemicals and from prolonged exposure to extremes of heat or humidity, such as kept in a bathroom as this can cause permanent changes to its appearance. Storing your piece in a pouch, box or lined jewelry case away from other jewelry will keep it lovely for many years to come.